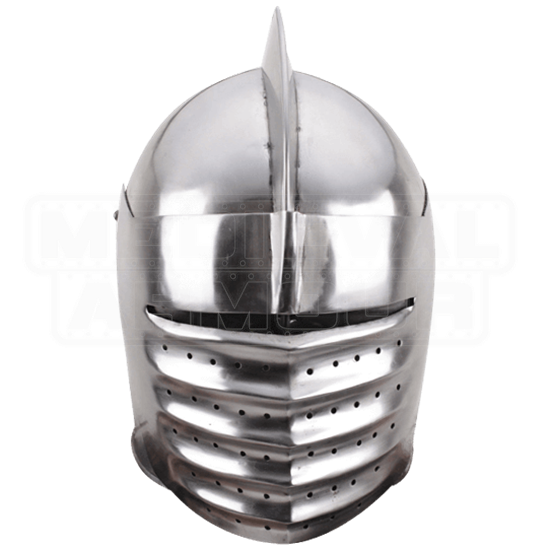 This Medieval Italian Knights Helmet is fully wearable and is a fantastic example of the style worn by Italian knights in the 15th century. The helmet is made from 18-gauge stainless steel and features an authentic appearance. This helmet was designed to provide maximum protection in battle and during jousts. The full-face design and corrugated face mask left little room for blows to connect. A ridge runs from the front to back on top of the helmet. The visor can be flipped up when not in use. This helmet is perfect for costume use, and it would look stunning as a display piece in any home or office.